Who doesn’t love pulled pork? 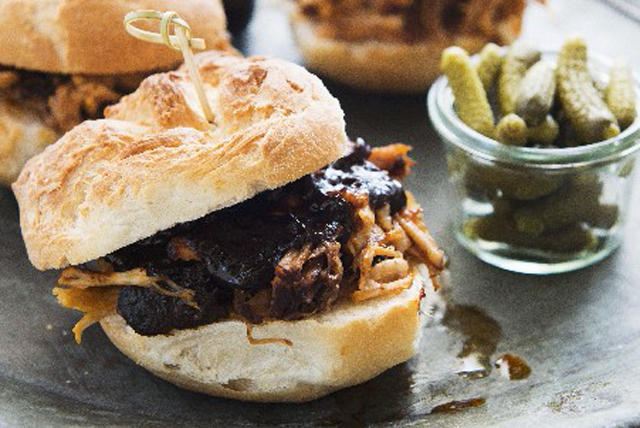 This pulled pork sandwich recipe features perfect fork-tender meat after long, slow cooking. Serve with tangy coleslaw for a match made in heaven. Place first five ingredients in slow cooker; cover with lid. Cook on low 8 hours (or on high 6 hours). Remove meat from slow cooker; cut off and discard excess fat and liquid. Shred meat with fork; return to slow cooker. Microwave barbecue sauce on HIGH 40 sec. or until heated, stirring half way. Add sauce to slow cooker; stir until meat is evenly coated. Fill buns with meat mixture. The GUINNESS word is a trademark and is used under license. © Guinness & Co. Serve with gherkin pickles and extra barbecue sauce.